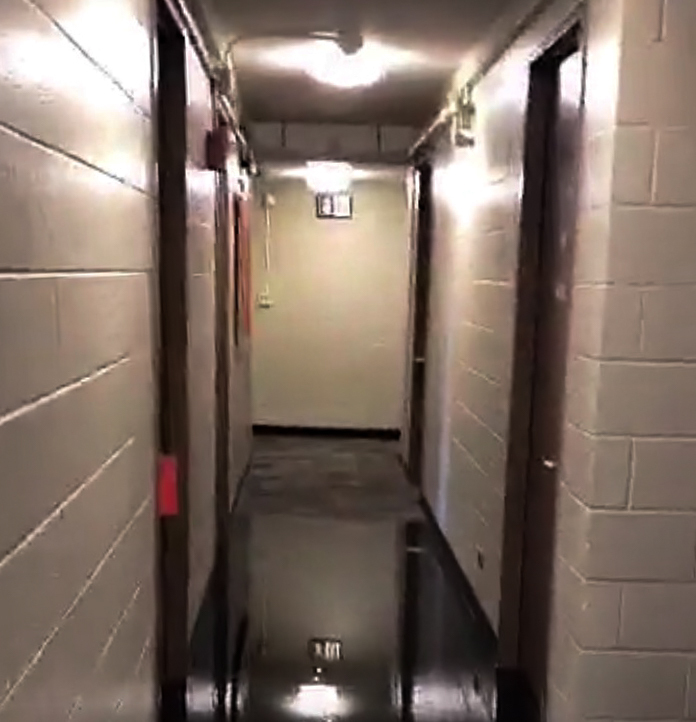 Butterfields C flooded after the building’s sprinkler system was set off by a student on the third floor on Saturday, April 28. The flooding was caused by a student pulling a sweater down from a shelf, which subsequently hit a sprinkler in the room. The sprinkler system, according to those at the scene, went off for around 20 minutes before firemen could turn it off. Students in the building were evacuated for the day. According to Director of Public Safety Scott Rhode, the incident was reported at 11:09 a.m. on Saturday morning. The fire alarm went off around this time, and students exited the building. Students then received an email update at 1:14 p.m. that they could return to rooms and pick up any essential items and were told they would receive an update on the situation by 5 p.m. At this time, much of the building was without power. An update then came at 5:06 p.m., informing students that if they lived in rooms without water damage, they would be allowed to once again return to grab items. Students were told they would know by 7 p.m. whether they could return for the night. But at 6:43 p.m., all students were informed that they could officially re-enter the dorm. Area Coordinator (AC) Alexia Thompson, who was on duty at the time, was called in early in the morning and informed of the situation. “When I got there, students were in the Butts, the Fire Department was already there, and people were outside, so I got briefed on what was going on because they were getting people out of the building,” Thompson said. Thompson’s main priority was ensuring the evacuated students in towels and robes could return to their rooms to get dressed. Thompson also kept students updated on when they could return to their dorms. According to Director of Physical Plant Alan Rubacha, the sprinkler system in the Butterfields is akin to most others on campus. A pipe connects water from the City of Middletown to a network of pipes in Butterfields C, which is designed based on codes concerning how much water should be distributed throughout the building. Rubacha also noted that the flooding in Butterfields C indicated the need to ensure sprinkler heads are covered in the future. This is the case for most sprinkler systems on campus, but because Butterfields C was not originally constructed with the sprinklers, much of the piping is exposed, leaving many sprinkler heads uncovered. A student who lives on the third floor of Butterfields C took responsibility for the flooding. In an email to the Butterfields C mailing list with the subject line “From a Sorry Butthead,” the student addressed the dorm members affected by the sprinklers. The student also noted that she felt that this incident indicated that the sprinkler system was evidently outdated. The student ended the email by mentioning damaged items and told dorm members that there is a current plan to address the University in coming days to determine the best course of action. The student asked dorm members to let them know of anything students want to bring to the University’s attention and gives “sincere apologies” for any sentimental items that were damaged. According to Thompson, some students had damaged items, while others only had floor damage. Though she does not have much information at this time, Thompson explained that the University is currently asking students for lists of damaged items, though no course of action with regard to compensation has been formally set. “I do think the University will do something for kids,” Thompson said. The student who admitted responsibility closed their email with a reiteration that the flooding was accidental.